I know I've already written about the unimaginable damage our state saw a week ago when the tornadoes hit, but it's still top of mind for me. I feel like I need to write a little more, do a little more. The company for which I work employs a few thousand people here in Birmingham. 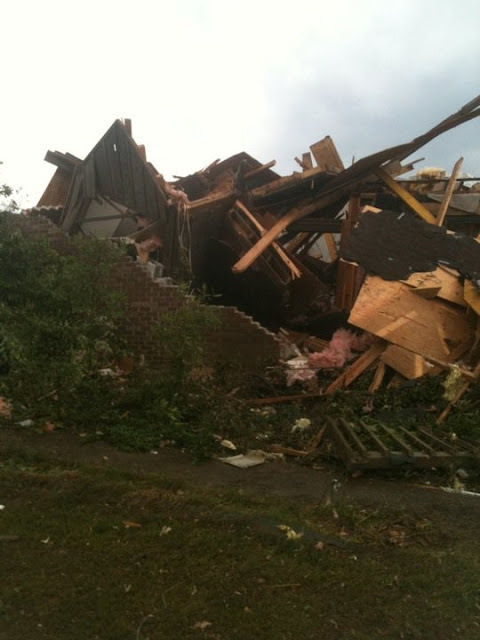 Many of them live in the devastated areas that were struck by one or more of the tornadoes. My friend J is one of them. When she and her husband heard that the storms were coming, they decided that although they had a basement, they needed to go to J's parents' house because their basement was completely underground. They wanted to be in the most protected place possible with their sons (ages 8 and 10). Part of their retaining wall still stands. And that's it. J told me yesterday that they were able to find a few pictures, one bunkbed and a few other things, but it will still be classified as a "total loss." Right now they're staying at her parents' house, and yesterday they met with FEMA to find out what their next steps are. But can you even IMAGINE? They have lost almost every material possession they had, all of their clothes, all of their sentimental items -- and I know it may sound silly at this point, but J spent years collecting Disney snow globes, and every one was smashed to bits. I don't have a collection of anything, but if I did, I know I'd be devastated to lose it. Several of you have e-mailed me or Tweeted to ask how you can help, and there are many ways. I personally am going to start with my friend J. Since they are staying with her parents, they don't have a place to store items that they'll eventually need to replace from their demolished home. Therefore, when I pressed her for their immediate needs, she said that a gift card to Wal-Mart would be the most sensible thing. I'm going to buy one next week, and if you'd like to add anything to it, please e-mail me at stainsofgrass@yahoo.com and I'll send you my address. I'll add any cash or checks I receive to the amount I'm planning to spend. Whether it's $5 or $25 doesn't matter ... when all you have left is dust, everything else is a true gift. On a broader scale, for locals there's a website called Hands On Birmingham that allows you to sign up for notification of projects in our area to help tornado survivors. If you subscribe, they'll send you e-mails about the projects that need volunteers, and you can sign up to help. For locals AND non-locals, Amazon.com has an Alabama Tornado Relief wishlist from which you can purchase things that the tornado victims need and have them shipped to the Christian Service Mission in Birmingham. CSM is the organization being used by many churches and other organizations to match supplies with affected areas most efficiently. My friend J is actually lucky when you consider that so many others lost their lives last week. And at my company alone -- actually, in the same building where J works -- there are stories that take my breath away. There's the woman whose toddler has a broken ankle because the wind pulled him out of her arms, and she hung on to his foot as the winds raged and he flailed in the air. She was able to hang onto his ankle, though, and now thankfully he’s "just" being treated for a broken foot. There's the woman whose adult family members and their two children were sucked out of their mobile home. The adults were thrown into the adjacent lake and drowned; the children landed in the grass but were unable to help their parents as they drowned in front of them. There are the parents who watched as their two children were sucked into the air. They watched them screaming and swirling in the winds of the tornado. They are still missing. Guys, I can't even handle it. Please keep our state in your prayers. Please keep these people in your prayers. Please reach out and help in any small way that you can. Words fail me. I'm so thankful you and your friend's family are all safe. The story of the woman holding on to her child's foot as he flailed in the air? Makes me want to go wake the (finally!) sleeping babies just to give them extra kisses. I'm putting some $ in the mail to help J's family. I've already missed the mailman today, but I should be able to get it out tomorrow. If you email me your address a check will be put in the mail to you. I am sitting here reading with cold chills running down my spine. I thought I had seen all the devastion after Katrina (my son was at Tulane in NO), but to read personal experience about someone that knows someone is heart wrenching. Makes us thankful for all we have.